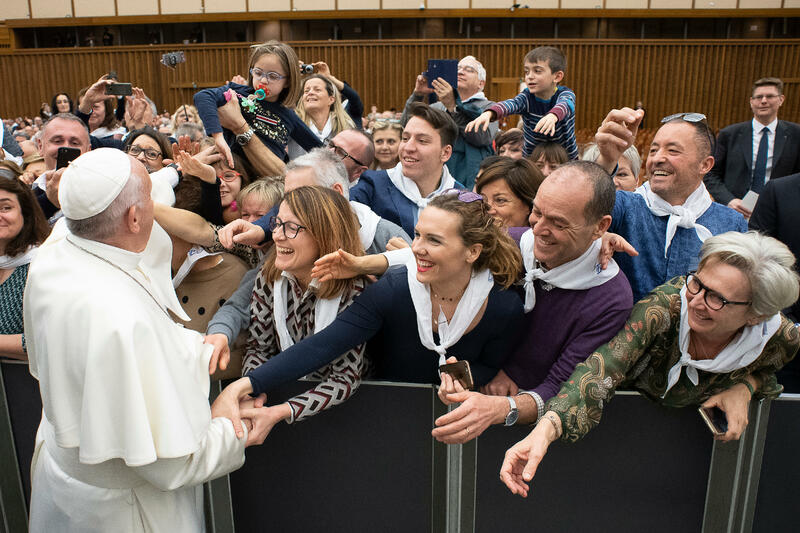 On March 22, 2019, in the Paul VI Hall, the Holy Father Francis received in audience the managers and members of the Youth Tourism Centre on the occasion of the seventieth anniversary of its founding. Your Association is turning seventy. This is a good milestone, but it is only part of a journey. Indeed, making the most of the precious journey you have made so far, you are called to grow further, to develop your activities and spread many other good fruits. Just seventy years ago, some young people from the Catholic Action Youth, traveling with Don Carlo Carretto on the train that took them to Geneva, had the idea of founding the Youth Tourism Centre. They felt this truly as an inspiration, so much so that after less than two months they established the Association, under the leadership of Don Carlo, proposing to become bearers, through multiple recreational and cultural activities, of social ties inspired by participation and an integral vision of the human person, cultivating the dream of inspiring and transforming the social environment. It is with these goals that your Association promotes tourism; tourism not inspired by the canons of consumerism or eager only to accumulate experiences, but able to favor the encounter between people and the territory and the growth of knowledge and mutual respect. If I visit a city, it is important that I not only know the monuments but also that I realize what history it has behind it, how its citizens live, what challenges they try to face. If I climb a mountain, besides keeping myself within the limits that nature imposes on me, I will have to respect it admiring its beauty and protecting its environment, thus creating a bond with natural elements, made up of knowledge, recognition, and appreciation. You have wisely defined this way of traveling as “Slow Tourism”, opposing it to mass tourism, as it promotes quality and experience, solidarity and sustainability. You have chosen a tortoise as a mascot of this careful and constructive tourism, depicted on this year’s membership card, which with its determined calm teaches us that slowness – if it is not the result of laziness – generates attention to places and people, loyalty to the earth and dedication to it. Now, the practice of “Slow Tourism”, based on cultural and environmental animation and education, helps you to experience every moment of everyday life, including those of work and greater effort, in a different and more conscious way. I, therefore, hope you will be able to maintain the breadth of your horizons, to experience spaces with the watchful slowness of the tortoise, and to inspire leisure time in a joyful and free way. As I greeted you, I made reference to the typical enthusiasm of your age; however, we must acknowledge that many young people, instead of wishing to build the future, unfortunately, feel disillusioned and unmotivated. Perhaps because of the pessimism that surrounds them, they do not dare to fly high but are content to survive or to run. This is bad, when a young person just gets by and does not truly live, as if he has already “retired”, and it is bad for a young person to be retired! Precisely in the light of your spirituality, within the Youth Tourist Centre, you can become travel companions for many of your peers; you can help them bring back enthusiasm if they no longer perceive it because they are buried by the rubble of disenchantment or by the dust of bad examples. Sharing free time as quality time can become a good key to opening the door of the hearts of many young people, generating bonds of friendship capable of conveying authentic values and faith itself. In the light of these considerations, we understand clearly how the memorial of the anniversary of the association means celebrating a calling and therefore recognizing a mission within the Church and the human family. Don Carlo Carretto would exhort each one of us, reminding us that “If you drink that wine that God Himself offers you, you are in joy” (Daily Meditations). Conserve the legacy of spirituality and the example of your founder. Live everything in prayer, and then in wonder and in thanksgiving. Today I pray with you and for you, that the Lord may continue to bless your work and accompany you with His consolation. And please, a prayer for me too. Thank you!